I’m positive many of you will be hyper and happy about this entry as I know quite a majority of my readers are big Lavshuca fans (as am I!). I was excited and disappointed with the Spring releases as the colors ended up being very dark and dull. My excitement at the release of new palettes was definately high however my first glimpse left me feeling rather crestfallen with the color selection being so very “un-Spring” like! The current palettes, entitled Noble On Eyes, have evolved yet again and although they remain familiar in size they differ in small ways from the standard Grade Eye Select Palettes in the general catalog. I was in high debate if I wanted any of this collection but as I am such a mush I gave into temptation and got all five palettes released and three of the new lipshades! A few of the differences that I took note of were the fact that the palette now consists of three colors instead of the standard four shades, the applicator is no longer a dual tipped sponge, it now has a brush on one end and a sponge liner brush on the other side, and the packaging of the palette is slightly different in color and design. The new packaging carries a floral cut along the outer edge all the way around and the color went from pinkish purple to a dark purplish pink. Most shocking is the fact that each of these palettes appear to carry all the same dark base colors while leaving us with one vibrant shade for our lid! Le Sigh! How very boring! However, the good news is that each has a bit of a lighter or darker shade to it so really even though they appear the same they have little tiny differences! Still disappointing none the less but at least it’s not a total loss that I have five palettes with the exact same colors! 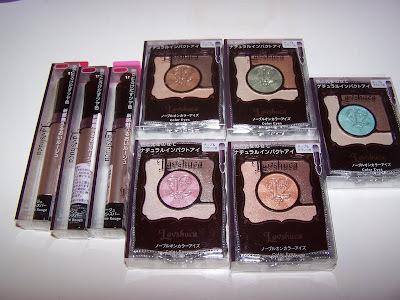 The palettes come in a pink, blue, green, orange, and tan variation. To create your look with these you’ll be using the lightest shade (on the bottom left corner) on your highbrow as a highlighter and also as a liner for your bottom lash line. You’ll use the middle color on your crease and the dark shade (upper right hand) as a liner. This is basically what I can glean from the diagram. Hmm. Sounds interesting!? I guess it’s best we use our imaginations while applying and see what we can do with such wonky colors! From what I can see BR1 and BG1 carry the same base colors while the middle color is different! PK1 may look dark but actually the lower left hand corner color appears to be a very sandy pink color to my eyes! GN1’s lower color is a golden sheen while OR1 is a sandy beige. The upper color is mostly the same in three out of five of the palettes. OR1, BG1, and BR1 appear the be the same while GN1 is a lighter variation and PK1 is the lightest in the lot! So even though they appear to carry the same colors they are very slightly different from each other aside from BR1 and BG1. The Spring Collection happened to bring a new color release for the Grade Color Select palettes which I didn’t get as it was blacks and grays and I have plenty of each. Sadly, no new colors for the Grade Eye Select which may mean they are phasing them out of the catalog. I hope not as they are actually my favorite! We shall see what Summer brings! It deserves to be mentioned that color pay off is what you make of it. A lighter hand will get you a beautiful natural look while a heavier hand that’s packing on color with leave you with a more bolder, vibrant look. 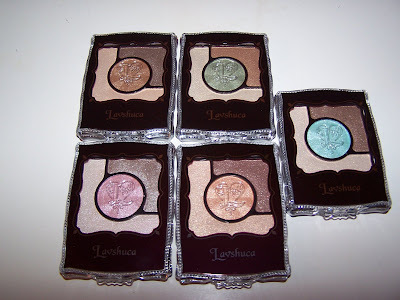 Lavshuca shadows have good pigment to them and with a little work you can create a lovely eye with them! I used BG1 this morning and sadly it came out a complete mess to me. Working the darker browns with the lighter aqua shade in the palette was difficult at best. The completed look, to me, appears very washed out and just ugly. I’m really not loving how these combine! Although they look great on Puffy in the promo images I am unable to prefect the same look. Using the darkest shade to line the aqua just made it a mess so I ended up removing it and tried applying the darker shade to my lid while highlighting with the aqua, again I got crummy results. I somehow ended up with the lightest shade highlighting my highbrow, the aqua all over my crease and lid, and the darkest shade applied lightly on my lid and lining my upper lashline! After all this drama I think it came out crap! Maybe I was rushing too much this morning so I can’t give these a totally bad review yet! I have to test a bit more to make my final decision. With the palettes they also introduced a brand new lipstick entitled Rouge Essence Bar. 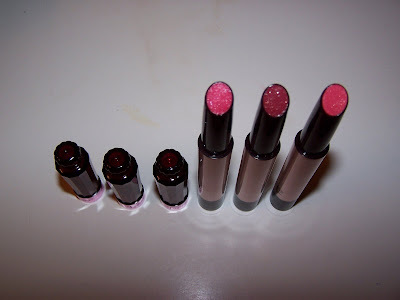 To me it’s basically the same old standard lipsticks but in keeping with the current theme they just packaged it different. 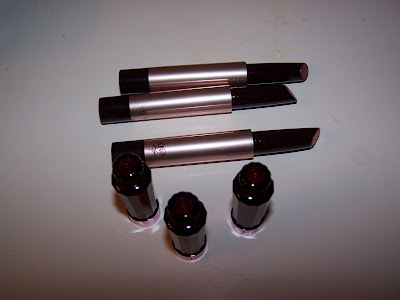 However, the formula for these does appear creamier and less gritty then the original lipshades. I find the old lipshades had glitter in them and weren’t as flawless to apply as these are plus they had a bit of a gritty feel to them! 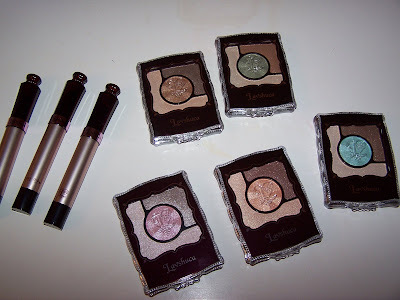 These are very moisturizing and creamy and have excellent color payoff and indeed they do have a touch of shimmer! I think I may want a few more of these! I ended up purchasing three colors. I’ll be uploading my FOTD later today so you can see one of the palettes in action! I’m not particularly thrilled with these to be honest and I think you can safely skip these if you’re unable to locate them at retail price. If you’re a collector or you can get these at retail they may very well be worth picking up. 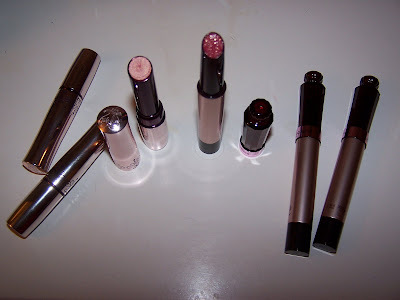 The lipsticks are a definite buy as I found them very good quality! Overall, a little bit of a disappointing collection! 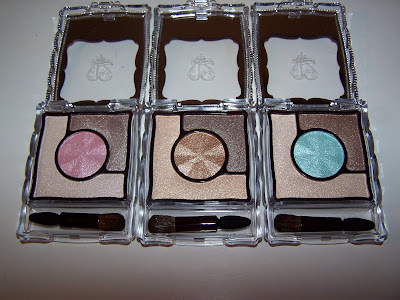 Loving the shades of the Noble Eye Palettes? haha love it that you don’t mind chatting with your readers. definately brought me out of the dark. haha I like the green palatte. look pretty nice, hopefully it turn out good too. take your time, Muse 😀 between posting new goodies on this blog, replying to all the comments you get, and your full time job, i can’t imagine you have much time left for anything. can’t wait to see your FOTD! They look pretty, but I always wonder – who in the Japanese naming department comes up with these product names? It’s crazy enough that you always get an “Engrish” description on skincare bottles, but Grade Color Select, Noble On Eyes, Rouge Essence Bar? It sounds like they take random words and throw them together with something makeup-related like “Rouge” or “Color”. 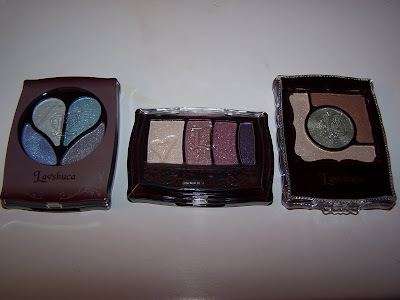 I did not like the new Lavshuca eyeshadow pallettes, but I did get one of the Rouge Essence Bar in RD1 and liked it for the texture and the hint of shimmer. I prefer the Lunasol and T’estimo lipsticks though. thanks sweetie 🙂 Sometimes I get a bit overwhelmed! Phew! LOL! True the names are slightly bizaaro! LOL LMAO! Sweet I’ll have you with the engine of the generator lol! Let’s see what can I correct Conc Color Rouge Select Blusher! How am I doing? 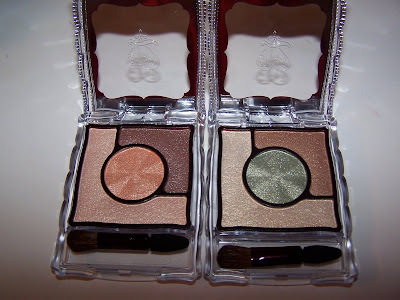 Rouge Grade A Select Eyeshadow! It all sounds quite like meat selections sometimes! Grade Select, Eye Select…it’s something you’d go to the butcher and say can I have some of the Grade Select Steak? And how about some of the Eye Select Ribs! I’m debating still if I love them or hate them! 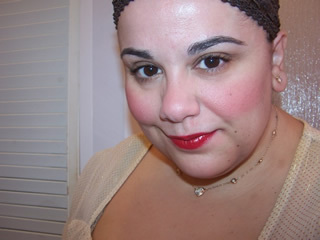 I liked the texture as well and the hint of shimmer but I agree 100% I like the feel and formula of the T’estimo lipsticks. They feel like I’m slathering water on my lips! So beautifully moisturizing!